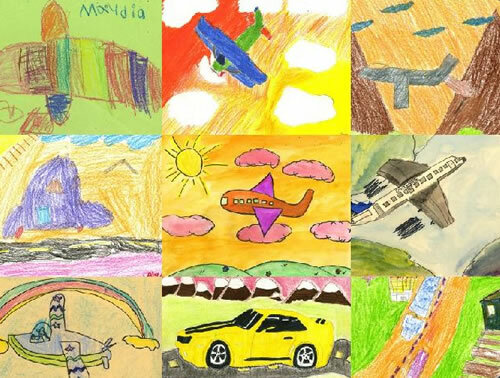 Imagine this: Ten photomosaics created using students' drawings of planes, trains, and automobiles, an art exhibit at McCarran International Airport in Las Vegas, needed to go online for easy viewing by the general public. Senior GIS programmer Don Kang and his team at the Clark County Department of Aviation in Nevada came up with an ingenious solution. They used ArcGIS to create the Children's Art Photomosaic website. The application for the site uses an image service created in ArcGIS for Server that lets you zoom in and clearly see each of the 100,000 images that make up the photomosaics. Read the article. Artist Robert Silvers used 30,000 pieces of children's art to create the photomosaics on display at McCarran International Airport. 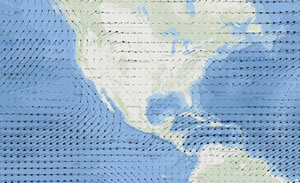 Learn to create a vector flow map to help your audience visualize geographic phenomena such as wind, water, or gravity. Read the tip. Collecting and reporting information and monitoring operations and systems in real time just became a lot easier with Esri's new Operations Dashboard for ArcGIS and Collector for ArcGIS apps. Read this article to find out how to use them. The Alabama Forestry Commission used ArcGIS to assess and map the damage to more than 200,000 acres of forestland after a swarm of deadly tornadoes struck the state two years ago. Read the article. Register for the Esri Forestry GIS Conference. Esri's new Education Ambassador program made inroads with students in Ghana when Bob Kolvoord traveled there to tell them about GIS and the power of spatial thinking and analysis. Read the article. Want to be an education ambassador? Apply today. Watch this series of presentations from the Esri International Developer Summit and find out where ArcGIS will go next. Josh Keller and Cory MacVie from the Federal Emergency Management Agency (FEMA) built the useful Check Your Home application after Superstorm Sandy hit. Read the article. GIS can be used to map bones. In one case, David C. Rose used ArcGIS to identify and map features inside a human foot bone. Read the article. Esri and Peking University will host the Geodesign International Conference in Beijing October 28–29, 2013. Register today. Learn a process for quickly migrating source data to the Local Government Information Model. ArcGIS is always evolving, so expect some exciting changes ahead. Many coming innovations were discussed at the Esri Federal GIS Conference. Read the article. Work in government? Choose from dozens of ArcGIS for Local Government no-cost maps and apps. See the City of Fort Lauderdale's GIS Application Gallery in action. Whether you will come by air, land, or sea, it's time to plan your week at the Esri International User Conference in San Diego, California. Listen to usability expert Jared M. Spool's Esri DevSummit talk, Anatomy of a Design Decision. He lays out five different styles of design. Which one is right for you? The Air Force used ArcToolbox with Python tools to create a repeatable process in ArcGIS for Desktop for quickly migrating to a new data model without a loss of data. The 10.2 beta release of ArcGIS Runtime SDK for Windows Store Apps is here. Read the blog. Missed the DevSummit or want to refresh your memory of a session? Download the proceedings. This is an open source toolkit for big spatial data analytics using the Hadoop framework. Read the blog. Use ArcGIS Online with ArcGIS for Server to give your organization's employees access to your map services. Read the article. Tune in to Esri's live training seminar Increase the Value of ArcGIS Services with ArcGIS Online on April 25, 2013. You can add Maplex labels as a tiled service to your ArcGIS Online web maps. Here's how. Watch this video of the soon-to-be-released Leap Motion Controller integrated with the ArcGIS for Desktop ArcGlobe application. Want to explore Arapahoe County, Colorado? Interested in Iowa State University? Take a tour of the maps contributed by Esri users. They shared this content for free in Esri's secure cloud through the Community Maps Program. 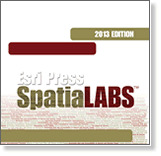 SpatiaLABS 2013 offers real-world scenarios in the form of lab exercises to teach college-level students how to apply spatial analysis to problem solving. Delivered on DVD, the 64 labs can be uploaded to the school's server for faculty. Try Esri CityEngine packaged with a Dell Precision Workstation. Esri CityEngine provides professional users with a conceptual design and modeling solution for generating high-quality 3D cities and buildings using their existing GIS data.